This series rewrites key judicial decisions on issues of gender justice. Applying feminist methods and theories to judicial decision making, it broadens theoretical and practical understanding of the importance of feminist legal theory for jurisprudence. 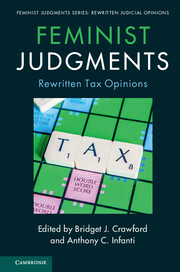 Through the rewritten opinions, the series examines whether systematic inequalities in the law are rooted in the perspective of decision makers.